I love to interact with fans and clients on my facebook page. In the last year, we have had quite a few contests, but this one was really special to me. The contest was winning the opportunity for a one lucky lady to be a treated like a model for the day in a “Top Model” inspired photo shoot. One of the reasons I started my business was to help women feel confident and beautiful so I asked my good friend, Geno (www.geno.ca) who happens to be a very talented professional photographer to join me in holding this contest. The response I got from the general public was amazing! It was very exciting for me to know that one lucky woman was going to have opportunity to feel like a model for the day where all the attention would be on her! I wanted to make sure that the winner through this process of getting glammed up, dressed up and photographed would feel very confident and special! This photoshoot contest was also an opportunity for me to showcase how I would style someone in terms of clothing, hair and makeup where I had complete control of the entire look. 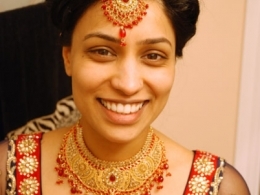 When I drew the winning name, Purnima Ahluwalia, I was really pleased as Purnima was one of my past brides! Purnima was so excited that she won the contest. Her enthusiasm to do the shoot as I had posted it as a model on the beach got me excited to create this scene of a beautiful, confident Indian woman strolling on the beach while her sari blows in the wind. 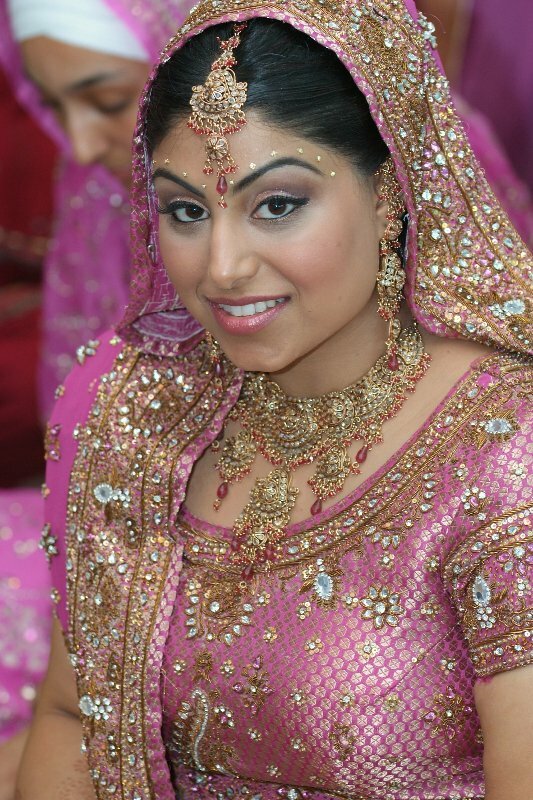 I told Purnima my idea of what type, style and color of Sari I wanted her to wear. She happened to have the perfect sari for the photoshoot. Although sari’s can be very heavy and hard to pin, the sari chosen for this photoshoot was a light, graphic fabric and I tied it only using 2 pins. The look of the sari needed to be stylish and comfortable but still pretty and soft. I decided to do soft beachy curls for Purnima’s long hair. There was not a lot of product in her hair as I still wanted the hair to move in the breeze. I kept the makeup in soft gold’s and browns with a brighter red lip. I made her beautiful brown eyes even more enchanting with a touch of green shadow under the lash line. 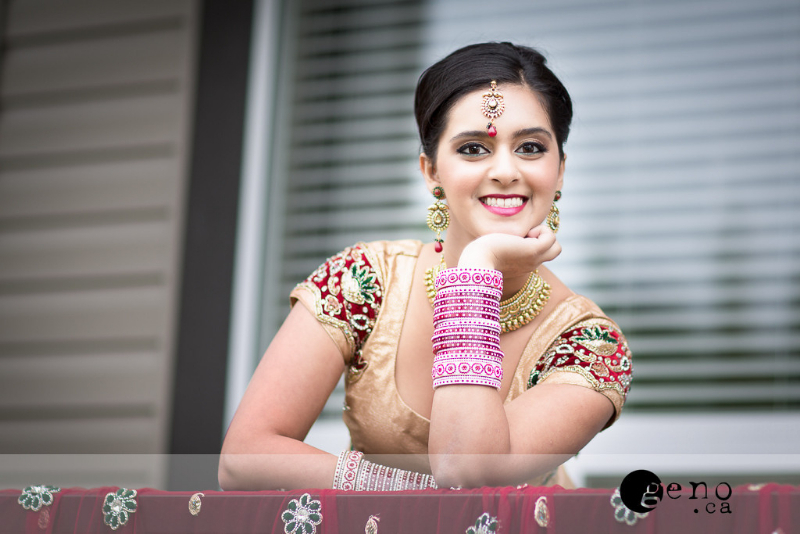 The entire time while I was getting Purnima ready for the photoshoot, she was so excited. She told me how special she felt and how excited she was to do a photoshoot with me as she was a big fan of my work. On top of this, Purnima was very excited to be photographed by the famous Geno! 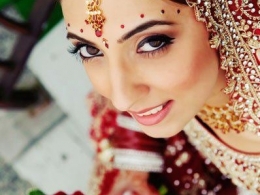 When Purnima’s look was done, she looked in the mirror and said, ” I can’t wait till my husband see’s me and we go out for dinner tonight!” She loved the way her makeup and hair looked and was sure that her husband would too! When we arrived at Crescent beach with our crew, people started to stop and stare. People thought Purnima was a supermodel and we were the paparazzi!! Some people even started taking photos with their cell phones. I’m not sure but I think they also might have thought she was Bollywood star. Purnima started getting a little nervous with all of this attention, I gave her a little pep talk and told her to focus on the crew and not on anyone else. As we walked to the location Geno had picked, she started to feel better. At this point, my beautiful model was in the hands of the photographer. Purnima started to relax and have fun. Geno started setting up the shots and directing our crew as well as Purnima on poses and body language. The crew, the photographer and myself kept the mood light in order to keep Purnima feeling comfortable. Because of this, Geno was also able to capture some amazing candid photos. The whole purpose of this contest was to make some lucky lady feel like a supermodel and that is exactly what happened! 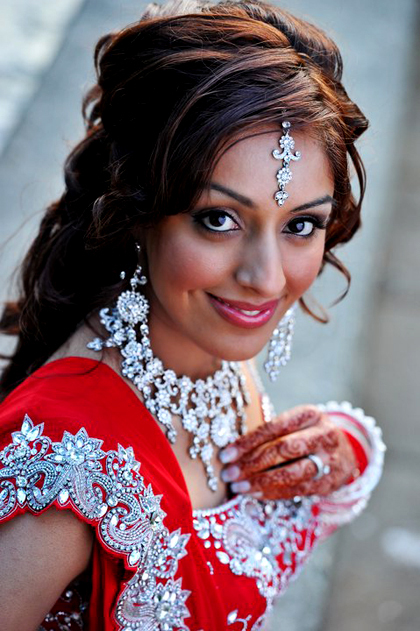 At the end of the shoot, Purnima asked if she could be the “face of Kim Basran”. It was so cute to hear her say that. And you never know, you might be seeing more of this gorgeous young lady!! 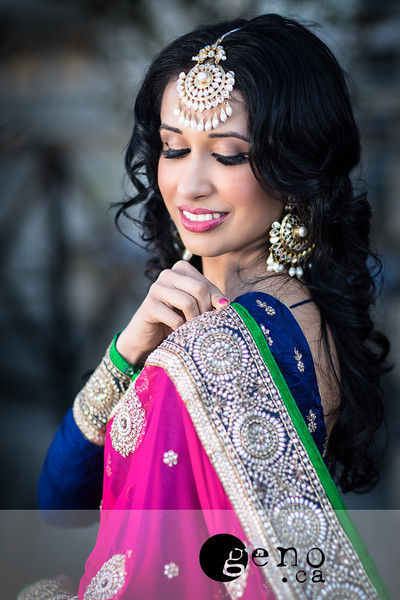 I had a great time working with Kim Basran and Purnima on this “Top Model” inspired photo shoot. 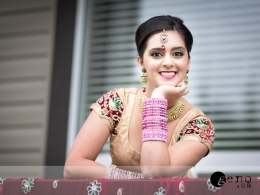 Kim did a great job with the makeup, hair and styling and I thought Purnima looked gorgeous. 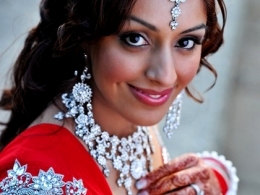 Purnima really stood out against the backdrop of Crescent beach. 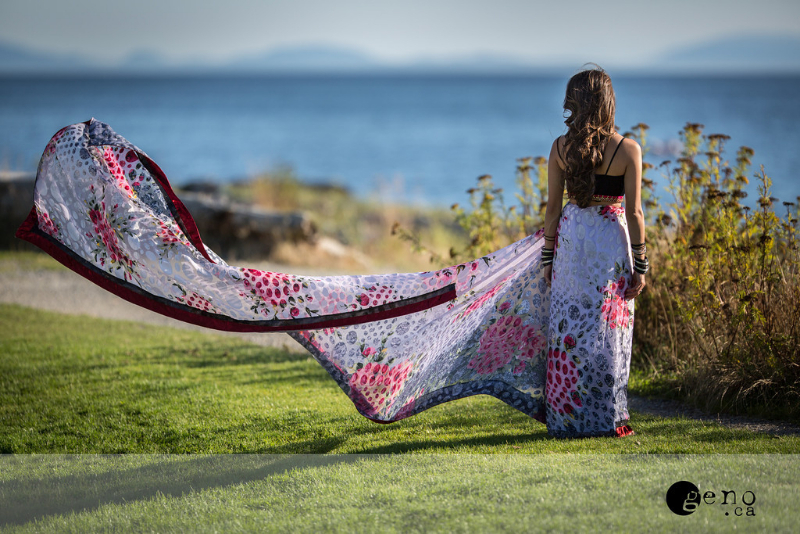 The contrast of the rocks and sky against Purnima’s beautiful sari made for a very inspiring photo shoot. 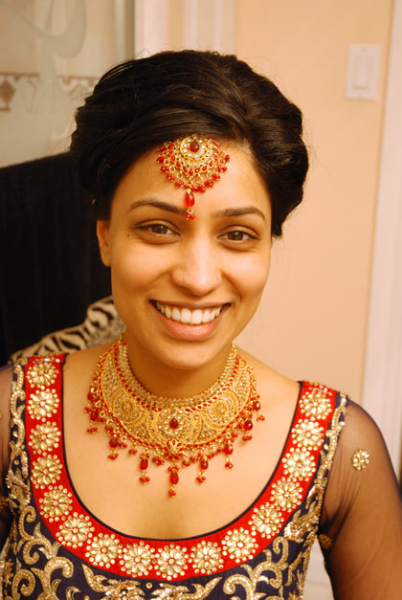 I had Kim do my makeup and hair during my wedding back in 2011 and I would never miss the opportunity to get dolled up by her again. So of course, I was extremely excited when I won the contest! When Kim called me to tell me I won, I was beyond excited to hear about the concept of the photoshoot! Working alongside Kim and Geno was amazing. Kim is very positive with her contagious personality and her passion for her work. The photoshoot was a completely different experience for me. I felt carefree and comfortable knowing the people I was working alongside are professional and easy to work with! I loved how my makeup looked so fresh and glowing. 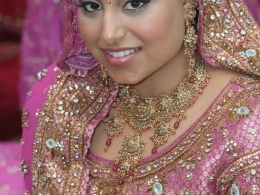 Kim did a great job with my makeup and hair and of course it lasted all day just like it did for my wedding. I was blown away by the photos. 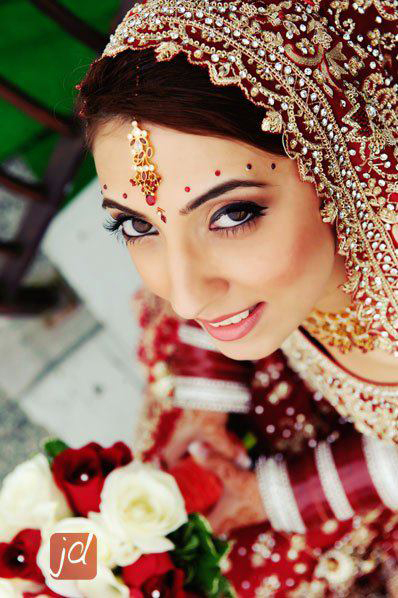 Friends and family commented on how beautiful the photos were and how amazing the look was for the shoot. Geno did a wonderful job with locations and photos! The whole experience was a lot of fun and Kim would be the first person I would recommend to anyone who is looking for a makeup and hair artist!